It's a testament to the Porsche Cayenne's torque that this was possible. Well, this is certainly a novel way to show off the prowess of the Porsche Cayenne. Over a decade ago, you may recall when a Volkswagen Touareg towed a 155-ton Boeing 747 jumbo jet for 150 meters. It was an impressive feat, but Nissan took this a stage further using a Patrol to tow a 170-ton cargo plane in 2013. VW's response? A Porsche Cayenne was used to tow the world’s largest passenger aircraft – a double-deck Airbus A380 weighing 285-tonnes. Oh and it broke a new world record by quite some margin. Porsche teamed up with Air France at the Paris Charles de Gaulle Airport for the publicity stunt, using a Cayenne S Diesel producing 385 horsepower and 627 lb-ft of torque of pulling power from its 4.1-liter V8. Despite the heft of the Airbus A380, this was enough to allow the diesel SUV to tow the jumbo jet for 42 meters, setting a new Guinness World Record for 'Heaviest aircraft pull by a production car', beating the Nissan Patrol’s previous record by 115 tonnes. Driving the record-setting Cayenne was Porsche GB technician Richard Payne. “It did it – I’m so relieved! We don’t usually go this far to test the limits of our cars but I think today we got pretty close,” he said. “I could tell that it was working hard but the Cayenne didn’t complain and just got on with it. My mirrors were quite full of Airbus, which was interesting. Our cars can go a bit beyond what our customers might expect – they’re designed to be tough. But even so, what the Cayenne did today was remarkable." Apart from a special towing attachment that sat on the SUV’s standard tow bar, the Cayenne used for the record was completely stock. 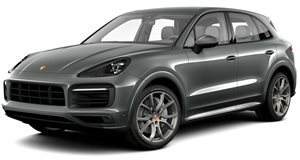 And just to prove that the feat was possible in a gasoline model, Porsche successfully repeated the stunt with a high performance Cayenne Turbo S, which has more power thanks to its 4.8-liter V8 producing 560 hp but 37 lb-ft less torque than the diesel mode. If you thought neither vehicle would be drivable after the stunt, think again – both were driven back to London where they came from. Seeing a Toyota Hilux get towed by miniature RC cars doesn’t look so impressive anymore, somehow.